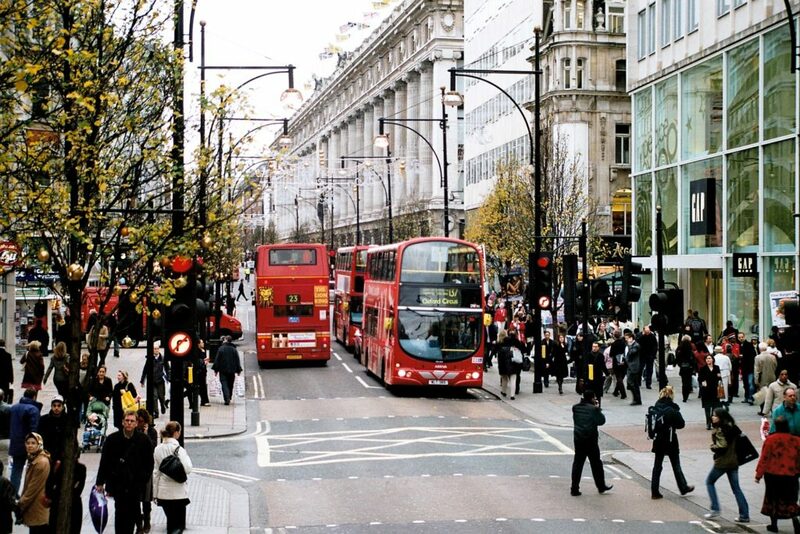 Whether it’s part of a family holiday or a weekend away with the girls, you’ll struggle to find a better place than London for an unforgettable shopping experience. 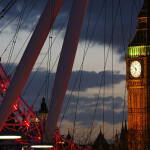 London is synonymous with big brands as well as niche shops you won’t find anywhere else in the world. Some of the shops in London are part of the very fabric of the city and some of the shopping arcades are the oldest in the world. The Melita Hotel is a family run hotel situated in a quiet, leafy area of the city with a suburban feel. But don’t let this fool you! 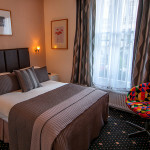 The hotel is just a nine-minute walk from Victoria station. You can go from the comfort of your bed to the shops in less than twenty minutes (but make sure you leave a bit of time for our fantastic english breakfast, you’ll certainly need the energy!). What better place to start than the most popular shopping area in Europe? There are over 300 shops in this area plus hundreds of places to eat and drink. 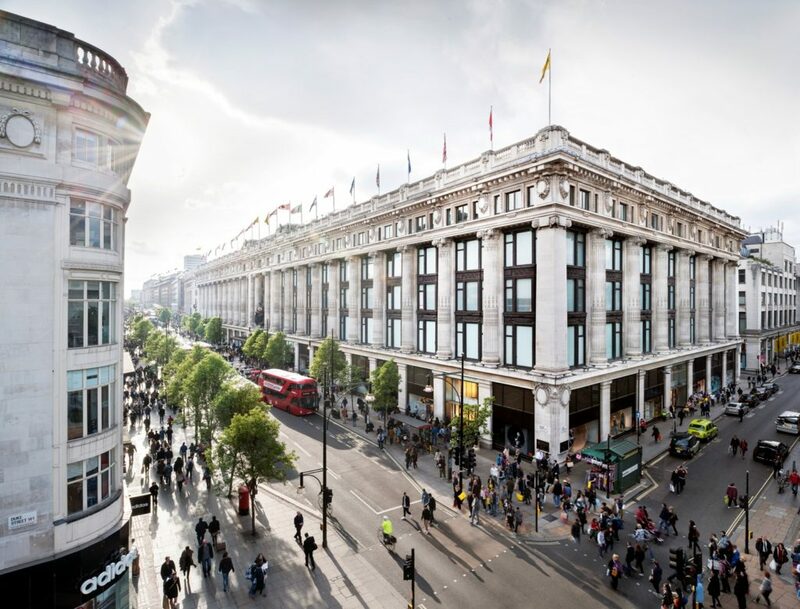 After your walk from the Melita to Victoria station, it is a ten-minute journey to the centre of your Oxford Street shopping experience, Oxford Circus. If you’re already out and about in London, then it is accessible from many more stations including: Bond St; Marble Arch; Piccadilly Circus and Tottenham Court Road. This is the place to shop if you are looking for big brands, Top Shop, Marks and Spencer, Next and John Lewis all have flagship stores here and you will find that most major retailers are represented in some way. 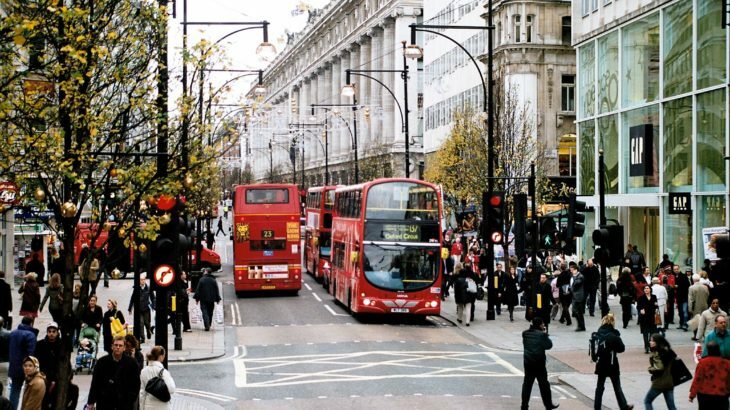 One word of warning, approximately half a million people trudge along Oxford Street daily, so it’s not for the claustrophobic! It is on this famous street you can also find one of the world’s most famous shops, as discussed below. This Oxford Street shop is the second largest store in the UK and is the flagship store for a brand which, in recent years, is now represented in other major cities around the country. It opened in 1909 and was the brainchild of an American, Harry Gordon Selfridge. His ideas on shopping were so original and innovative that they justified a British drama series documenting his life. If you’re a lady and you enjoy shopping, then you probably should thank Mr Selfridge for that. Through his London Selfridges he introduced the idea that shopping should be fun, that it should be considered a leisure activity rather than a chore that has to be completed. In Selfridges, he wanted to create a comfortable and safe place that was specifically for the leisure time of women. Selfridges was one of the first shops to have their products in front of the customers and let them pick them up, feel them and try them on. They were the first to put the perfume counter on the ground floor at the front of the shop. Mr Selfridge is also thought to have coined the phrase “The customer is always right”. When you’re in Oxford Street, don’t forget to visit this historical shopping treat, after all it might be the reason you enjoy shopping so much in the first place?! We mentioned that Selfridges was the second largest shop in the UK, the largest shop also happens to be the most famous retailer on the planet. Harrods opened its first shop in its current location in 1849. It was a small shop in a single room, employing just three people. It expanded at a phenomenal rate, taking over adjacent shops until it finally became the size it is today. 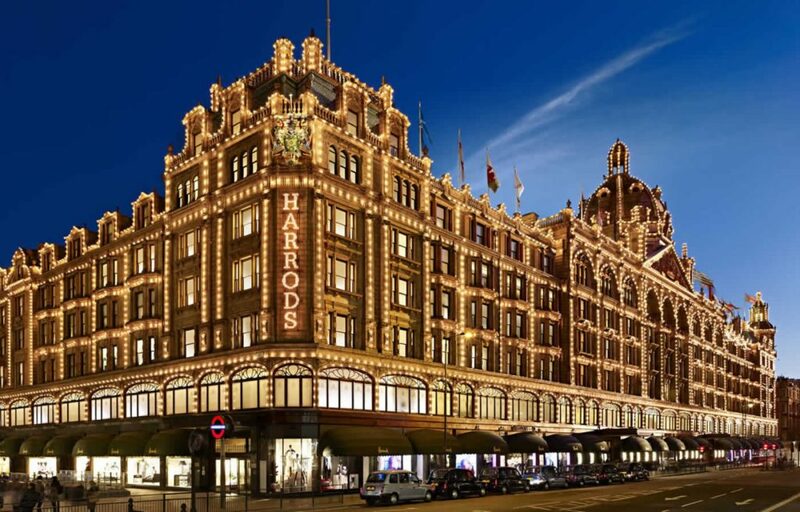 Harrods now occupies a five-acre plot, has over 330 departments and offers over one million square feet of retail space. There is not a lot that you can’t buy in this shop, clothes for everybody for every occasion, electronics, some of the most elaborate and expensive jewellery in the world, food and drink, furniture, children’s toys and even pets…! As of 2009 the store started selling gold bars for purchase off the shelf! The shop now employs 5,000 staff from over fifty countries, employed to deal with over 300,000 customers daily. One word of warning, the shop does employ a dress code but is not quite clear on what it is! It has turned away tracksuit wearers and people with mohicans before now. Probably best just make sure that you haven’t been playing football in the park beforehand and you’ll be OK! 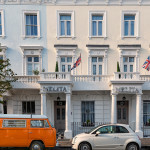 South Kensington station is just two stops away from the Melita Hotel on the Circle and District Lines from Victoria station. For a more authentic experience, change at Green Park to arrive at Knightsbridge station, right next to the famous shop. It is rare nowadays to see another Oxford Street, a continuously expanding, natural urban sprawl. Instead retail spaces are purpose built, it seems every major town and city has a shopping centre, a mall or an arcade. But this type of shopping experience isn’t new. Perhaps the most famous shopping arcade in London, the Burlington Arcade first opened in 1819 and it is only one stop away on the tube from the Melita Hotel. Bizarrely it wasn’t originally conceived as a ‘new way to shop’. It was commissioned by a neighbour whose garden wall backed on to a parade of shops. He was fed up with shoppers throwing litter over his back wall so commissioned an architect to come up with a solution. The covered Burlington Arcade was born. 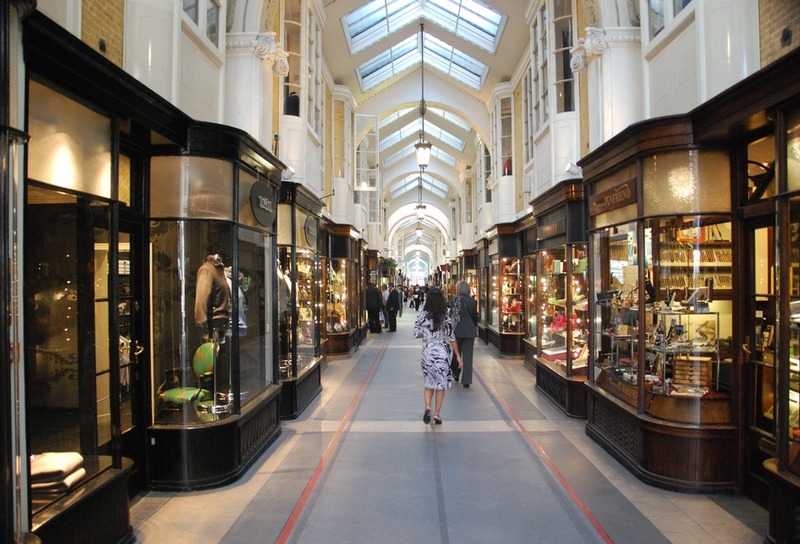 A step into the Burlington Arcade is like a step back in time. You won’t find many household names here, it’s a traditional shopping experience with the outlets themselves being protected monuments. You’ll find seventy-two outlets, each specialising in either fashion, fragrance or jewellery. Antique watches are a specialty for some shops, with one offering Rolexes manufactured in every year from the 1920s onwards. The arcade lurches from the traditional to the quirky in some instances. Its rules and regulations are enforced by its own tiny police force, The Burlington beadles. The beadles ensure that all of the old rules are upheld, like, ‘no running in the arcade allowed’ and ‘no unfurled umbrellas’! 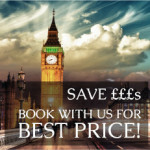 Use the Melita Hotel as a base for your London shopping trip for an experience you won’t forget. After you’ve finished, you could be back in your room, glass of wine in hand celebrating your new purchases within minutes.